The products are organised in multiple categories. H.264 hardware encoding modules offer excellent encoding quality and low latency. The NVIDIA Jetson TX1 compute modules integrate a 64 bit quad core ARM processor, a H.264/H.265 hardware encoder, and a GPU to implement video processing tasks. Auvidea offers a line of carrier boards for various applications and use cases. The compact SDI/HDMI to CSI-2 to modules add HD-SDI or HDMI inputs the SOC platforms with CSI-2 inputs. 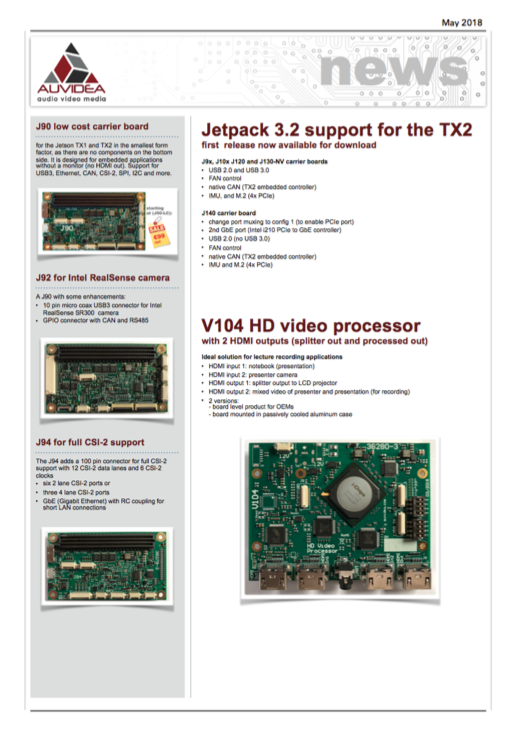 In particular the Raspberry Pi and the Jetson TX1 are supported. The video processors perform scaling, cropping, de-interlacing, rotation, and merging to combine 2 video inputs. HDMI, HD-SDI and analog video inputs are supported. Auvidea is developing multiple products such as CAN centric converter modules, flight controllers and power distribution boards.